Nothing creates a stronger bond than shared purpose and a mutual reliance. This webinar series is dedicated to showing how Business Relationship Managers (BRMs) are working with, not against, other roles and disciplines within an organization. To achieve a converged state, we must understand the roles and responsibilities outside of our own and work together to achieve organizational success. 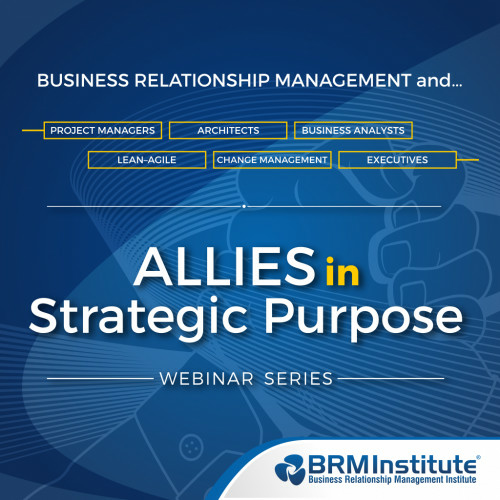 During this webinar, we will hear from a Business Relationship Manager (BRM) and an Executive with experience and a clear understanding of how these two roles work together in business strategy and to provide results. They will also highlight how they work together on focus, ideation, value planning, reporting structure, and shaping demand. All roles and functions will benefit from this insightful, educational session. Register now to learn more and ask questions.